After getting addicted to painkillers, Gerry Paglione used a subterfuge to get access to the medicine cabinets of his friends and family members in search of pills. 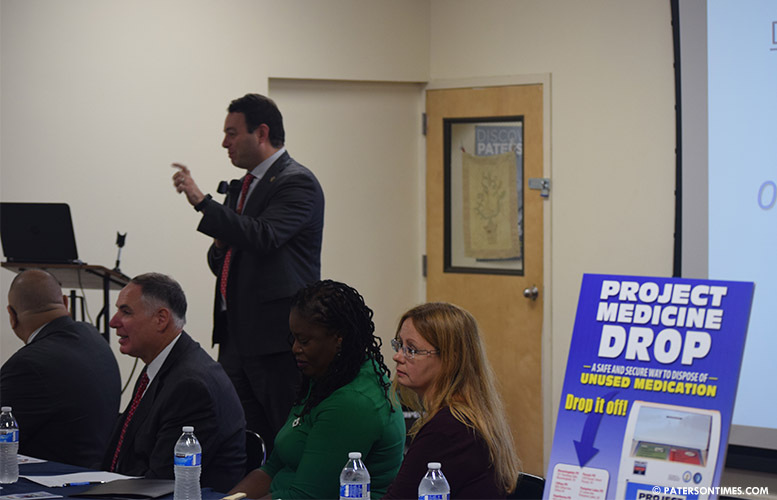 Paglione was one of two people, recovering from addiction, to speak at the Straight and Narrow in support of the National Prescription Drug Take-Back Day, which falls on Saturday. State, county, and municipal officials held the kickoff to the statewide “Project Medicine Drop Off” day to encourage residents of New Jersey to go to their police stations and drop off unused and unneeded drugs. “If people are prescribed these medications and they are not taking them, sometimes there is that temptation for other outlets. ‘Let me sell this and make some money. Let me give this to someone else.’ It’s part of the epidemic. It’s a huge problem in my opinion,” said Kristen Besold. Besold’s story began in 2010 with taking pills from other people who had been prescribed strong painkillers. She started abusing and selling Oxycodone at age 22. She would persuade people to give up their unused pills to her for cash. As she was selling, she was also increasing her intake of painkillers, she told about 100 people at the Straight and Narrow. “It slowly tore my life apart,” said Besold of East Brunswick. She was enrolled in Rutgers University. She failed her classes. Besold’s story may have never happened had people she knew avoided keeping unused and unneeded drugs in their medicine cabinets. This is why officials are urging New Jerseyans to find the closest “Project Medicine Drop Off” box, often located in police departments, to get rid of their unused and unwanted pills. Passaic County had 15 boxes in 2017. 4,006 pounds of pills were collected last year, up from 706 pounds in 2014, when the drop boxes were first installed in various towns, according to Brenda Browne, mental health and addiction services director at Passaic County. In 2015, 1,347 pounds were collected. In 2016, 2,544 pounds. The number of drop boxes in Passaic County increased at the same time from 6 in 2014 to 15 in 2017. The number of boxes – with addition of Haledon and Prospect Park — increased to 17 in 2018, said Sherrine Schuldt, director of United for Prevention in Passaic County. Schuldt said there are two boxes in Paterson. One at the Passaic County administration building and another at the Passaic County Jail. There are no boxes at the Paterson Police Department, she said. That may change in matter of months. Schuldt approached police chief Troy Oswald to urge him to install a drop off box at the Frank X. Graves Public Safety Complex. She told the chief he did not have to pay for the box, but to make sure it’s secure and have police drop off its content to a facility in Newark. “I’d really love to do it,” said Oswald. A box typically costs $1,000 said Schuldt. Her organization will pay for the box, she said. The city was approached to hold a drop box four years ago, but police, understaffed, did not want the added responsibility of making the trip to Newark to drop off the collected medicine, according to police officials. “It’s not just an addiction issue, it’s a safety issue for our children,” added Dennis Gonzalez, executive officer for the U.S. Department of Health and Human Services, Region II. Thousands of children end up in the emergency room after ingesting pills from medicine cabinets every year, he said. Gonzalez wants people to get rid of not just opioids, but all unused and unneeded drugs sitting inside medicine cabinets. Find the nearest drop box by visiting the U.S. Drug Enforcement Agency website at https://takebackday.dea.gov.